Easy Stuffed Peppers made with beef, Italian sausage, tomato sauce and garlic. The perfect filling meal that can even be made ahead of time! We LOVE this easy dinner recipe. It comes together quickly and leaves you with a filling meal that is perfect for weeknight dinners or weekend favorites. You can even make it ahead of time, which can be oh-so convenient! Make the filling, fill your peppers, and refrigerate. When you are ready to heat, simply add 10 minutes to the baking time and a little extra tomato sauce. I do suggest only keeping premade peppers for 1 day. Oh, and did I mention you can make them in a SLOW COOKER? That is right, folks. This recipe comes out amazing as a slow cooker dinner recipe. Add an extra heaping spoonful of sauce to the top of each and cook on low 6 to 8 hours. We eat it as is or as a salad topping. It is my husband’s favorite way to serve stuffed peppers. After they are done cooking, Chop one pepper. Place over a bed of greens and serve with your favorite salad dressing. What peppers should you use in a stuffed pepper recipe? 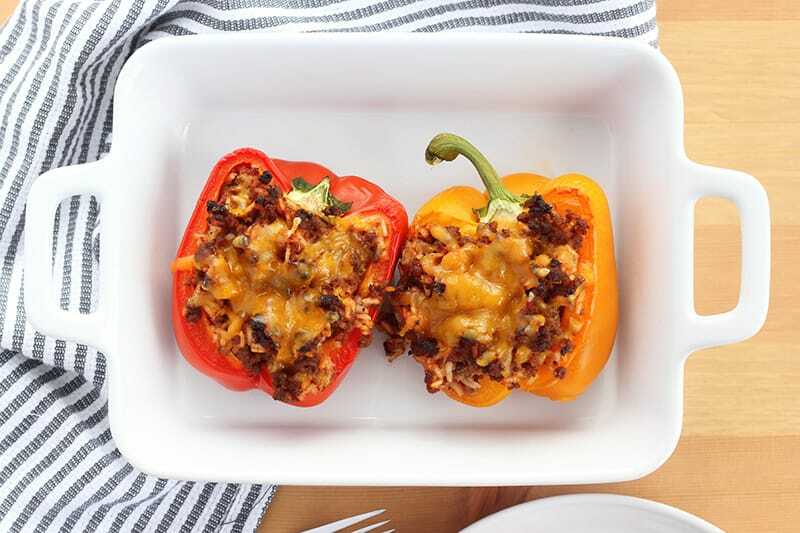 For this recipe, bell peppers are the preferred pepper to use. They have a crunchy, slightly sweet, and aromatic flavor that is perfect for this dish. They also come in a variety of colors making it an easy way to brighten up your meal. Do you need to cook the peppers before using in a stuffed pepper recipe? I have heard it both ways. Some people strongly suggest that you do blanch or steam your peppers. I haven’t found that super necessary. We do not cook our peppers before baking. However, you definitely could if you wanted to. Can I add extra sauce to stuffed peppers? YES. The amount of sauce that this recipe calls for is perfect for our tastes. I have had readers tell me that they prefer to add an extra 6-8 oz of tomato sauce into their mix. It all comes down to your personal preference. 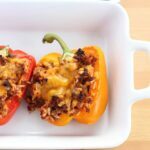 Can I add vegetables to stuffed pepper filling? This is another big ol’ YES. Chop up zucchini, stir in corn, or even a little jalapeno for kick! We kept the base recipe fairly simple but don’t hesitate to add in our favorite vegetables as we see fit. Preheat your oven to 350 degrees. Cut the peppers in half length wise. Scrape out the seeds and discard. Brown the sausage with the ground beef. Drain any excess liquid. 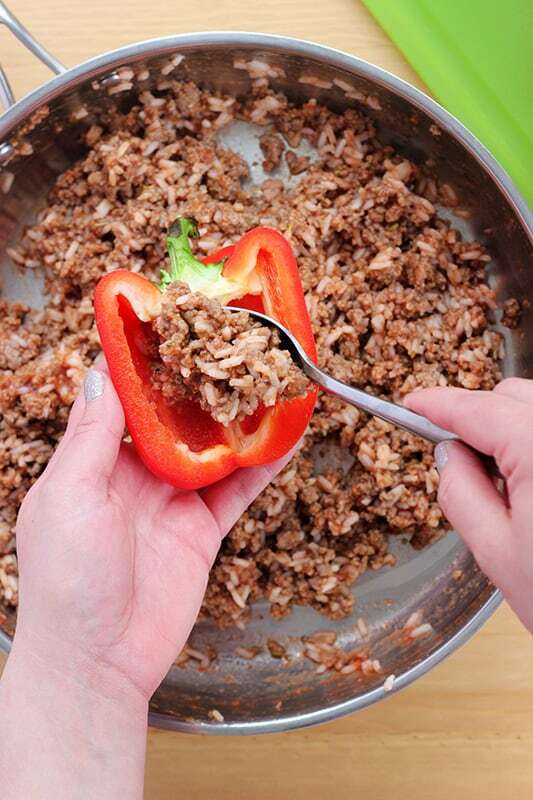 Combine the meat with the rice, tomato sauce, Worcestershire, garlic powder, and onion powder in a large bowl. Stir to combine. 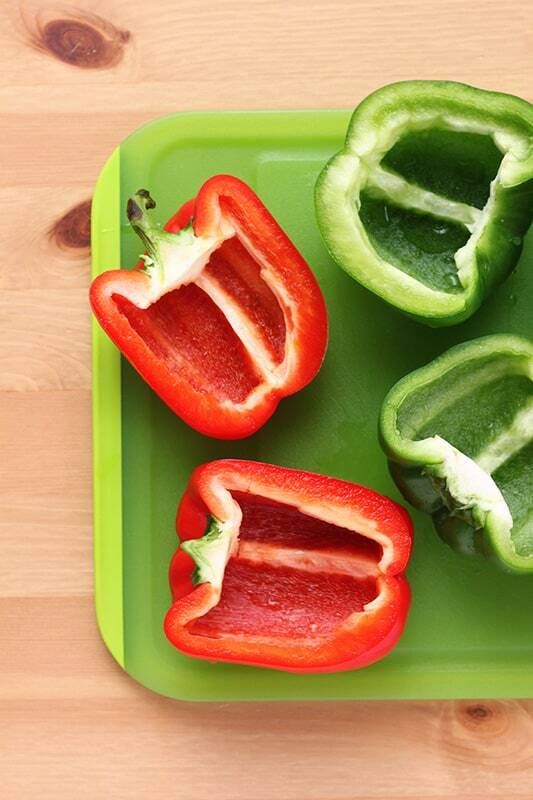 Fill each of your peppers with heaping amounts of your mixture. Cover with tin foil and bake for 45 minutes or until your peppers are tender. Uncover, sprinkle each with cheese and cook an additional 2-3 minutes or until melted. 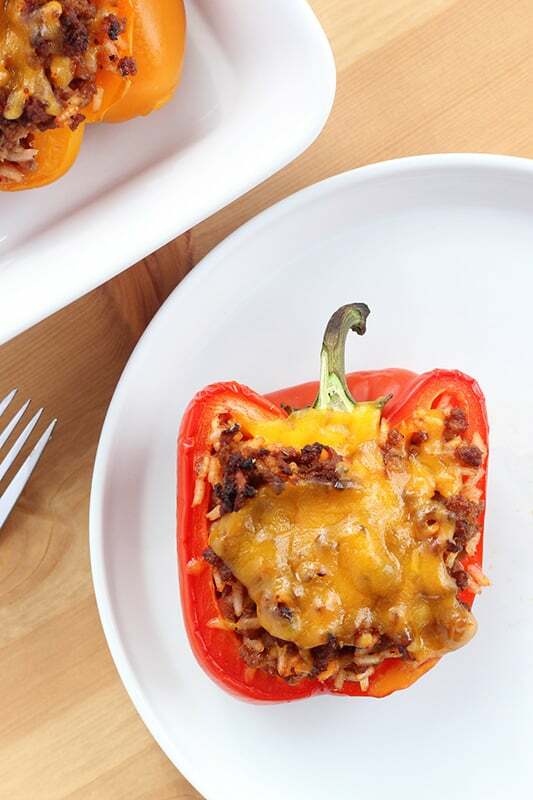 I love stuffed peppers – they are one of our fav dinners. I love that Dax enjoyed them.. without even realizing they were the peppers that he wouldn’t try before! Score for you! I LOVE stuffed peppers and other stuffed vegetables like squash. Can’t wait to try them! I also couldn’t resist pinning. Oh yum! 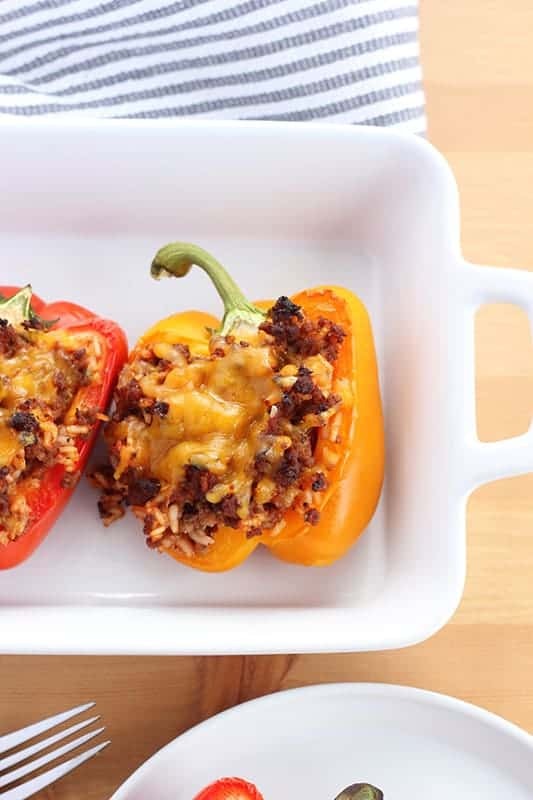 There are several recipes I want to try in a stuffed pepper – adding this to the list! I love the color of your pictures. Using different colored peppers would get my family excited about eatin this. Thanks for the recipe. These look amazing! I am not usually a pepper lovin gal, but I think I will have to give this a try. Thanks for the recipe. Those look soooo good, I’m going to have to try it! Those look great! I wish my husband could be fooled by me switching the colors of the peppers. These look wonderful! I finally have peppers coming in from my garden and this would be a perfect use for them.